One of the oldest sales ‘tricks' I learned is that as soon as you enter a prospect’s office you should look for something you have in common. Picture of himself fishing? Talk about the trips you used to take with your dad. Picture of his kids? WOW! You get to chat with her about YOUR kids. There are 5 Representational Systems and they are associated with our senses. Each of us favors one of them in how we learn and if you can master the technique of learning which one your clients and prospects favor, your communication with them will be more effective. The shorthand way of describing Representational Systems is by the acronym VAKOG. 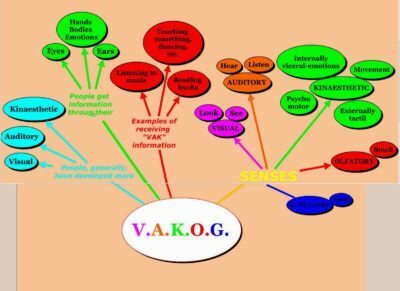 VAKOG is an acronym for VISUAL, AUDITORY, KINETIC, OLIFACTORY, and GUSTATORY. There is another called Auditory Digital. How does that look? Looks good to me. I see what you mean. Let me paint you a picture. I hear you. Sounds good. That rings true. It’s music to my ears. I hear that loud and clear. Do you feel me? Reach your goals. Touch your goals. Results are within your grasp. AUDITORY DIGITAL – This person will spend a fair amount of time talking to themselves. They memorize by steps, procedures, and sequences. They will be interested in your program if it ‘makes sense.’ The AD people can exhibit characteristics of the other major representative systems. You may be curious how to use these learning modalities in your work. While they are not a guarantee of closing the deal, you ARE helping people capture your message. During our Small Business Marketing Plan Bootcamps, we have coaching breaks after each section. As a way to capture attention, we use sentences like: “In this last section, who saw something new?” and “What rang the most true?” and “How will it help you reach your goals?” and “What this section means to you is….. Finally, let’s remember a study dating back to 1964 (Professor Albert Mehrabian) first stated that the words you say are 7% of what someone uses to make a decision. 38% is decided by HOW you say it and 55% is the physiology. We will discuss these differences in an upcoming blog. If you want help deciding which of the Representational Systems apply to you, connect with us and we will share a test with you that will demonstrate it. Call us at 800-705-4265 or go to BoxFullOfMarketing.com and you can get into our calendar after taking a short marketing assessment survey. *Sharyn and Hank Yuloff are certified Neuro Linguistic Programming practitioners.